This classical revival school building stands five stories tall at the intersection of Edgecombe Avenue and West 135th Street proudly facing St. Nicholas Park. 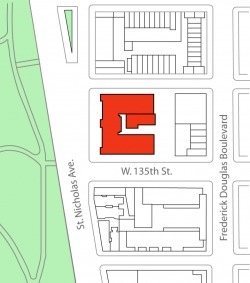 The site is an important educational facility for the Hamilton Heights neighborhood. This building was the former I.S. 136, a junior high school for many years until the late 1990s when it was appropriated to accommodate the Bread and Roses Integrated Arts High School. Mott Hall High School and Knowledge and Power Preparatory Academy IV (KAPPA IV) moved in 2004 and have shared the building since then. The appearance of this classical revival beauty does not reveal its age -- the façade remains in great shape. The Board of Education erected I.S. 136 in 1925 -- one of many standardized New York public schools designed by the architect William H. Gompert. The U-shaped building's red brick façade has a strong presence on the streetscape and yet blends harmoniously with the character of the neighborhood. Carol Foresta, a strong advocate for progressive education, created the Bread and Roses Integrated High School in 1997. The school was envisioned as a collaborative effort by the founder and affiliated partners. It has a special focus on art and a portfolio requirement for each arts related course. There are currently 518 students enrolled. In the early years, soon after the school was launched, the school suffered academically -- student performance failed to meet city standards and consequently the school landed itself a spot on the state's list of schools needing improvement (SINI). However, presently, the school has made progress owing to the efforts and cooperation put in by the students, parents and faculty. Student performance has improved significantly compared to that of the school's early years. With continuous hard work, one would hope to see great success from this school in the near future. Knowledge and Power Preparatory Academy IV (KAPPA IV) opened in September 2004. KAPPA IV is a middle school serving a student population of 279. The school was created based upon the Knowledge in Power Program (KIPP) by Replications, Inc., a non-profit organization with a mission to replicate academically successful school models. KAPPA IV boasts an intensive academic curriculum with special emphasis on English, math, and Greek language. One unique feature of KAPPA that differentiates it from other schools is the KAPPA LOOT program. KAPPA LOOT is a point system program that rewards students based on academic success, proper conduct and individual behavior. At the end of each week, students are issued a paycheck (KAPPA LOOT) that is valid for purchases at the school store. The amount each student earns is dependent on his/her own performance. The Mott Hall High School is located on the fourth floor in the building. Currently 388 students are enrolled. Created by Replications, Inc. in 2004—the school was modeled after three other successful Mott Hall middle schools in New York City. The corridors of Mott Hall are alive with school spirit decorated with portraits of each student along with school banners and colors. In addition to the academic curriculum, community service credits are required. School leaders are passionate about nurturing students to become responsible productive individuals. These schools were amongst the ranks of poor performing city public schools. They were labeled as failing schools with academic achievement below state standards. They are slowly improving owing to the combined efforts of the students, faculty, community partners, and parents. Community partners and organizations show their commitment to the schools and its students by investing their time and resources. The curriculum is tailored toward college and career preparation. Teachers and faculty work closely together to monitor student academic progress. The level of collaboration and communication demonstrated by the affiliated parties reveals the strength and commitment of this community. The spirit of these schools is truly admirable.